Who is it for? Garnier Skin Naturals Super Hydrating Sheet Mask is a water-based sheet mask with Hyaluronic Acid, an ingredient naturally found in skin, floods skin with intense, weightless hydration. Free of mineral oil and petrolatum, this non-greasy formula, with green tea extract, provides a soothing burst of hydration and a fresher, softer, more radiant look. 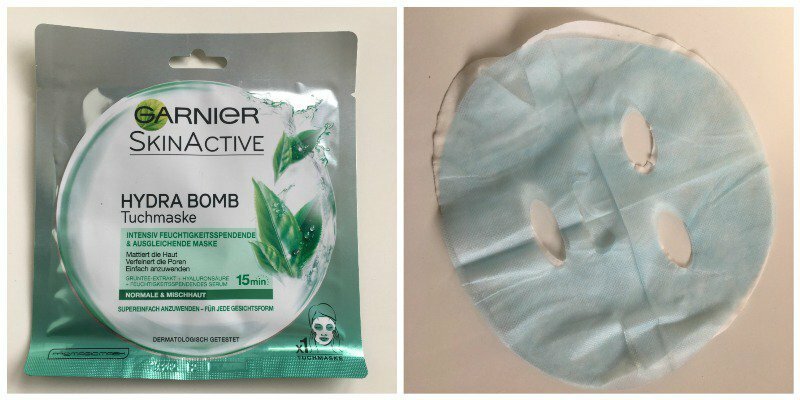 Garnier Sakura White Super Hydrating Pinkish Glow Tissue Mask comes in a sweet packaging showing a gradation from silver to green colour and with leaves on it. The package can be opened easily and inside it is the mask drenching in the serum. All the claims and the instructions are written on the mask. It is quite travel friendly. Lately, I was breaking out and had to use tons of acne controlling products which left my skin peeling and feeling dehydrated. I decided to use this mask to provide my skin with much needed serum. The mask in itself was pleasant. I put it on for around about 20 minutes. After 20 minutes I massaged the excess serum on my face and neck. It provided my skin with that much needed serum and I could see the effects next day also. It’s suitable people with dry skin. Nothing as such, but I feel Korean sheet masks does a better job. Yes, I’ll definitely recommend it. For me it’s the best among the other two.